I served it with a summer salad filled with English peas, barely steamed crispy green beans, toasted pine nuts, arrugula and a lemon vinaigrette. I will post that next because it was such a fresh pairing with the rich crepes. 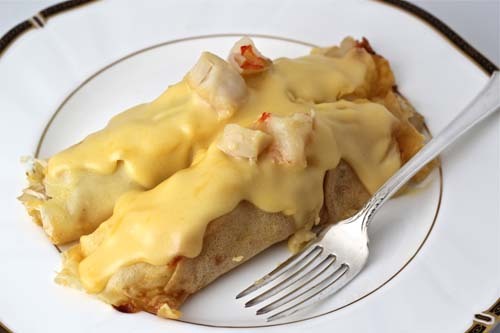 If you have a special occasion dinner coming up, these crepes might be just the thing. Place your batter bowl very close to the stove. 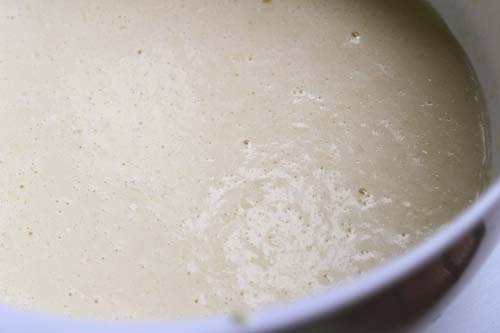 Heat your pan on medium heat until hot and then using a 1/3 c. measuring cup, scoop out 1/3 c. of the batter and lift your pan off the burner and up to the batter bowl and pour in the crepe batter, swirl it around the pan with your wrist so the batter amply covers the bottom (only) of the pan. Place the pan back on the burner and cook for about a minute or a little less. You can peek underneath the crepe with a spatula and if it is slightly golden, you can take it off. Let it cool while you make your next crepe and while the next crepe is cooking for a minute cover your last crepe with a sheet of the wax paper. Thank you! The girls loved it and I got my mom’s seal of approval! How sweet to say that. Thank you. Sure, why not Chung-Ah?! I hope you are doing great! Congratulations on the graduation! That dish certainly is celebration worthy, it looks fantastic! OMGosh!!! That looks so good!!! Looks delicious! And congratulations to your daughter on her graduation. Um, YUM! Looks amazing. My only issue with serving this to 11 people would be not having leftovers. Or not being able to eat it all myself! Greg, you know me…well sort of…would I not have left-overs?! I made about 16! This sounds FANTASTIC, Geni! I would never make this for a crowd though. I’d be all in favor of saving the leftovers just for me. My seafood craving just doubled. What a wonderful entree for a celebration! Your crepes look perfectly cooked, done but not at all browned. Congratulations to the grads, to be sure, but you, too, deserve applause for this dinner. Well done, Geni! I’m pinning this so that I don’t lose track of it. I will make this! Congratulations to the graduates! I can hardly cook a meal for 2, never mind 11! The thought of a dinner party is making me faint… But you pulled it off well. These look excellent! Congratulations to Zoie and Lindsey. The dish looks deliciously beautiful. Congratulations to the girls. Wishing them bright, happy & peaceful life’s ahead. I have some prawns in the freezer calling to me right now. Delicious ! Congrats to the graduates! 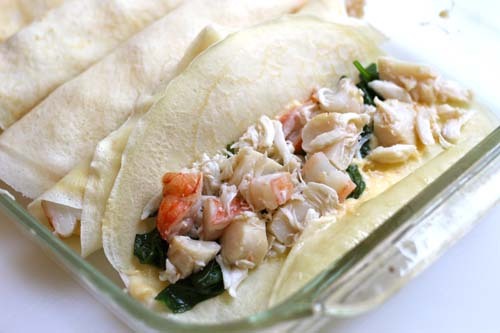 What a great milestone and what a way to celebrate with these creamy dreamy seafood crepes. These look seriously delicious. I love crepes, but savory ones are my fav! 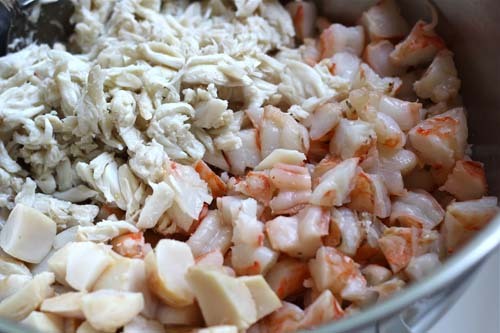 These seafood ones look simply wonderful. 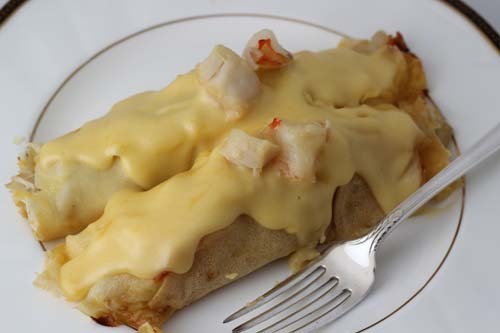 Love your seafood crepes..they are so tasty. Wow, what an incredibly decadent dinner! How awesome for Zoie and Lindsey! Congratulations to them both!! And to mom, of course! So wonderful, too when you make something that earns mom’s seal of approval! How elegant! Congrats to them! Congrats to your daughter and niece for graduating! Always a fun celebration 🙂 These crepes look amazing! I’ve always been intimidated to make my own crepes, but yours look fantastic, as does the filling! Beautifully done! Congrats to your daughter and niece! Graduation is so exciting. I don’t think I would have even known what seafood crepes were when I was your daughter’s age! Quite the foodie is right, 🙂 She made a great choice! This might be the best crepe that I had ever seen, bring it on seafood! What an elegant and beautiful dish. Perfect fit for a celebration dinner. Thanks for sharing Geni. Have a great week! that shot of the shrimp is breathtaking. 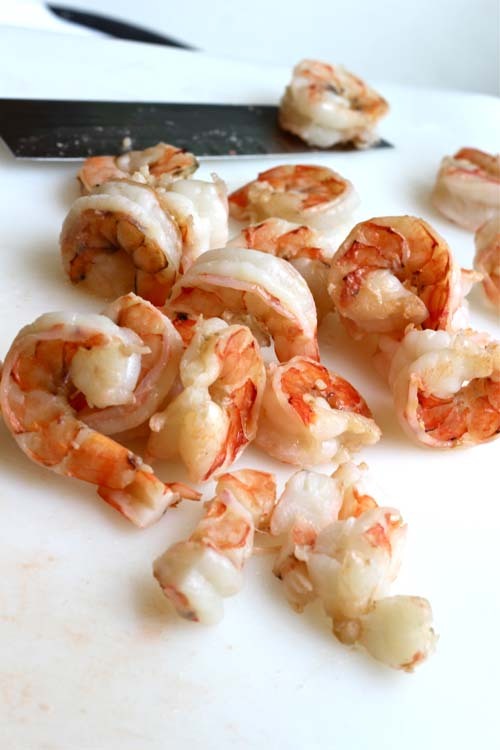 exactly what shrimp should look like. I am drooling over this! unbelievable! Hope you’re having a wonderful Tuesday! I could eat a whole dish of these crepes! 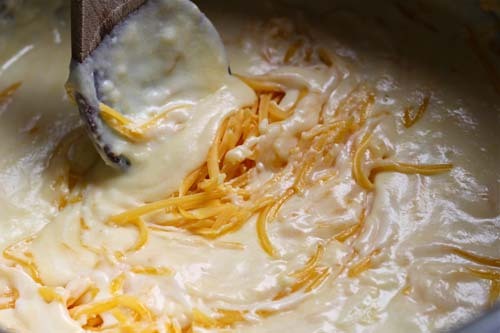 They look absolutely delicious and the mornay sauce – YUM!